In 2008, the sprawling global bank, Citigroup, created under the controversial repeal of the Glass-Steagall Act, blew itself up with toxic debt hidden in the dark in the Cayman Islands in an exotic framework called Structured Investment Vehicles or SIVs. The unwilling taxpayer was forced into servitude to bail out this hubris that had occurred at the hands of captured regulators, infusing $45 billion in equity, over $300 billion in asset guarantees, and $2.5 trillion in below-market loans. At the time of its implosion, Citigroup had over 2,000 subsidiaries, affiliates or joint ventures, many of which operated in the dark in foreign locales. Most Americans, and, sadly, members of Congress, believe that Citigroup is the parent of all those branch banks holding FDIC-insured deposits across America and bearing that angelic red halo over the word “Citi.” But Citigroup is far more than that. A recent record search by Wall Street On Parade suggests that Citigroup may be operating one of Wall Street’s largest collections of dark pools, trading stocks 24/7 around the globe in de facto unregulated stock exchanges which it operates under a dizzying array of different names. For the first time ever, the Financial Industry Regulatory Authority has started releasing partial trading data for dark pools. For the week of May 26, 2014, FINRA data shows that Liquifi, a dark pool owned by a unit of Citigroup, traded 5,865,427 shares of stock; another dark pool owned by a unit of Citigroup, LavaFlow, traded 98,604,159 shares of stock; and Citi Cross, also owned by a unit of Citigroup, traded 37,547,262 shares of stock. 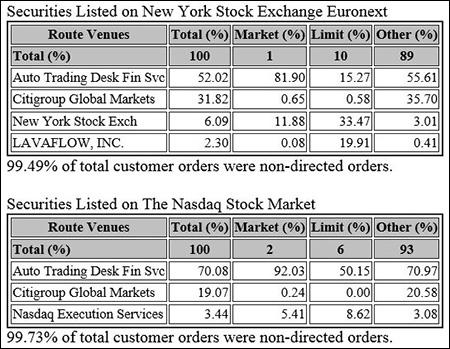 The SEC Rule 606 report (as shown in part below) indicates that 52.02 percent of Citigroup’s customers’ orders in New York Stock Exchange Euronext listed stocks were routed to a company called Automated Trading Desk Financial Services. According to Citigroup’s disclosure, it owns that company and “potentially stands to profit by trading as principal with its customers’ orders.” Citigroup Global Markets (or ostensibly its dark pools) accounted for another 31.82 percent with LavaFlow receiving 2.30 percent. In short, Citigroup routed 92.23 percent of its customers’ orders in New York Stock Exchange Euronext traded stocks – to itself. Automated Trading Desk’s web site says that it trades on average, “200 million shares a day.” If you add that 1 billion a week to the 142 million shares Citigroup reported to FINRA for its dark pools, it looks like Citigroup is eclipsing Credit Suisse and Goldman Sachs as a trading juggernaut. But why isn’t Automated Trading Desk included in FINRA’s data. Citigroup, in its own report, refers to the company as “a significant market center.” And, surely if it’s trading 1 billion shares of stock a week it is indeed “a significant market center,” but unburdened with the pesky regulations of a stock exchange and excused from burdens like trotting up to the Hill yesterday to explain cozy dealings to Senator Carl Levin’s Permanent Subcommittee on Investigations. We reached out to the SEC, asking if Automated Trading Desk is not a regulated stock exchange and it’s not an ATS (Alternative Trading System a/k/a “dark pool”), what is it. The SEC promptly advised that Automated Trading Desk is, simply, a broker. According to FINRA’s files on the firm, various incarnations of the company have been repeatedly sanctioned for bad practices: like trading for its own account ahead of its customers’ limit orders. Wasn’t the Volcker Rule under the 2010 Dodd-Frank financial reform legislation supposed to prevent systemically risky financial institutions from trading for their own account? After stalling the implementation of the Volcker Rule for years, when the SEC finally did get around to implementing a weakened version of it, the new pushed-out effective date became the summer of 2015. Citigroup bought the company in 2007 for $680 million in cash and stock. Unfortunately, the cash portion was only approximately $102.6 million. As 2008 unfolded, Citigroup’s shares would lose the bulk of their value as its dark toxic debt came into the sunshine. Key ATD shareholders, including Whitcomb, filed a class action lawsuit against Citigroup. Citigroup settled the case for $590 million in 2012. Automated Trading Desk says on its web site that “From our ever-expanding retail execution to the institutional markets to creating the first-ever automated pinks and bullies execution system, ATD is leveraging our technology to become a single source destination for all U.S. equity order flow.” That certainly sounds like a stock exchange to us – why isn’t it regulated like the New York Stock Exchange? 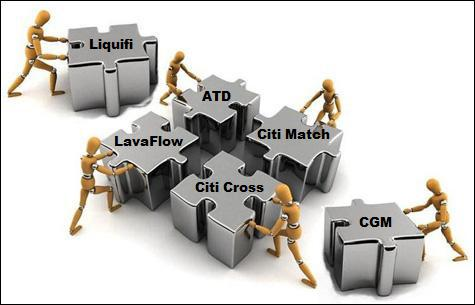 Automated Trading Desk, LavaFlow, Liquifi and Citi Cross are not the only big trading platforms owned by Citigroup where there is a lack of trading data transparency. According to SEC records, Citigroup also owns Citi Credit Cross. Citigroup also says on its web site that Citi Match is a “leading internal crossing network, available globally” and “consistently ranked in the top two dark pools in Europe. It offers anonymous access to premium liquidity and price improvement.” Where’s the trading data for that one? FINRA records also show that Citigroup is operating 48 foreign firms trading securities. A sampling of those names shows: Monex Group, Inc. in Tokyo; ZAO Citigroup Global Markets in Moscow; Citivalores S.A. in Panama City. In addition to all of this darkness, records show that discount brokers are being paid by trading units of Citigroup to send their “dumb money” (a phrase used by New York State Attorney General Eric Schneiderman to correctly describe retail customers’ order flow) to Citigroup’s trading platforms. The payments are known as PFOF – payment for order flow — a tactic used by Ponzi-schemer Bernie Madoff in his securities trading division — that actually did trade stocks. While discount brokers argue that they only use trade execution firms that provide fair customer prices, Senator Carl Levin showed yesterday in a Senate hearing that TD Ameritrade was directing its order flow to the firms that paid it the highest rebate per share. Also discussed at yesterday’s Senate hearing is the fact that while stock markets are setting new highs, stock ownership among U.S. adults is at a 16-year low, trending down from 65 percent participation in 2007 to a reading of 52 percent today, according to a Gallup poll released in May. The ability to rig markets is always so much easier in the dark. And until Congress brings sunshine into the nether world of Wall Street’s dark pools, public confidence is not coming back any time soon.